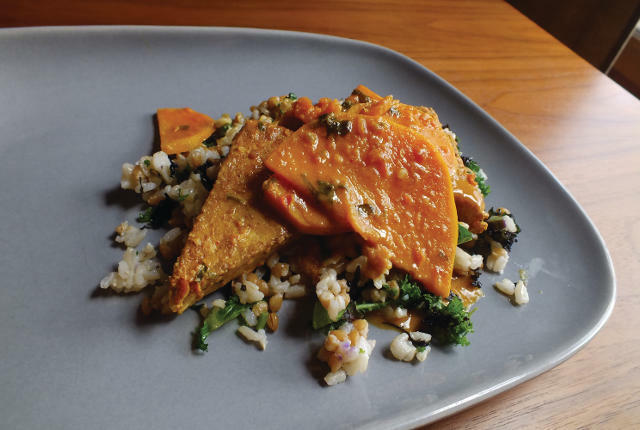 If you’re one of the long-time Iowa City residents who fondly remembers the now-defunct Red Avocado, you’re in luck: Chef David Burt’s succulent vegan fare is still around, and you can eat it at home. 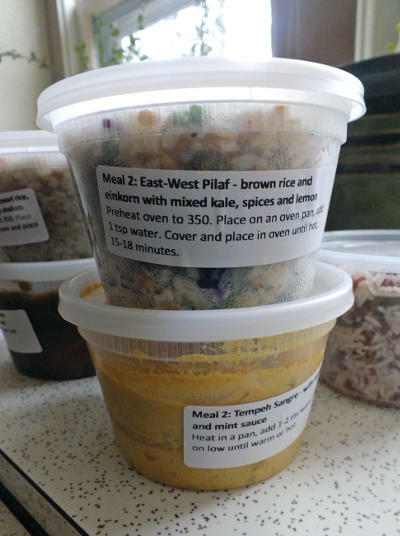 Burt’s Four Square Meals — a professionally prepared weekly meal service — is a delicious and convenient addition to your diet. The catering program brings back some favorites from the Red Avocado, Burt’s former restaurant, while also introducing diners to new, inventively prepared vegan treats, available for pickup or delivery. Pricing and details are available at foursquaremealsiowa.com. While I love to cook all manner of vegetables, I was pleasantly surprised both by how convenient the meal plan is, and by how satisfyingly hearty the vegan meals are. On a recent gray, windy day, I curled up with a buckwheat and millet stew with bok choi, and seitan “Sunday roast” with eggplants and carrots; the rich, brown gravy had me nostalgic for my grandma, and, since I was eating at home, it was totally okay for me to lick the plate clean. Each day’s meal contains two separate dishes, all featuring a variety of vegetables, and each pushing the boundaries of what we may expect when we think “vegan food.” The light freshness of Kansas Avenue tofu, in a creamy, cumin-laced broth, was perfectly balanced by savory Athena salad, thick with brown rice and barley, dressed with a piquant umeboshi vinaigrette. I am eager to try other favorites, like curried tofu in tomato-ginger sauce, or golden glazed potatoes roasted with Japanese eggplant, garlic, ginger and turmeric. Subscribers may elect to receive four meals per week, or they may simply sign up for the service when they want to. Especially with the holidays approaching, Four Square Meals is a wonderful respite from cooking and hosting, or perhaps even a great gift for a harried parent. Meals average about $10 a piece, and portions are substantial. According to Burt, some clients use the meals to supplement their existing diets, choosing to balance a meat-based diet with the carefully selected vegetable choices. Ingredients for all meals are organic and locally sourced when possible, and Burt will ship within the Midwest. He is also happy to accommodate specific dining needs, sometimes with a small surcharge. Each entrée comes with simple preparation directions; though Burt recommends the meals be heated on the stovetop or in the oven, the few I had to microwave seemed no worse for the wear, and there’s no debate that they were still far healthier and prepared with more love than other convenient options. I look forward to seeing how Burt’s creative menu continues to change with the seasons. This article was originally published in Little Village issue 189. I highly recommend these delicious meals! You can arrange to have them delivered to you if that is easier.